This Mock Test is created questions of Arithmetic Ability, also known as Quantitative Aptitude or Numerical Ability from Previous Year Recruitment Papers by our experts. 33.0003 % o f 509.999 = ? 1212.12 + 2121.21 + 1122.22 = ? 4 5 12 39 160 805? 3 15 39 75 123 183 ? What would be the cost of laying a carpet on a floor which has its length and breadth in the respective ratio of 32 :21 and where its perimeter is 212 feet, if the cost per square foot of laying the carpet is Rs.2.5 ? Let the length and breadth of a floor be 32 x respectively. The simple interest accrued on an amount at the end of five years @ 1.2.5 p.c.p.a. is Rs. 1575. What is the amount? A 260 m long train crosses a platform thrice its length in 80 s. What is the speed of the train in km/h? If the cost of 8 erasers and 5 sharpeners is Rs.31, what will be the cost of 24 erasers and 10 sharpeners? In how many different ways can the letters of the word 'PRETTY'be arranged? A boat while travelling upstream covers a distance of 18 km at the speed of 3 km/h, whereas while travelling downstream it covers the same distance at a speed of 9 km/h. What is the speed of the boat in still water? What is the area of a circle whose circumference is 132 cm? Shreyas bought an article and sold it for 125%o of its cost price. What was the cost price of the article, if Shreyas sold it for Rs. 30750? The ages of Mira, Tina and Sania are in the ratio of 6 : 4 : 7 respectively. If the sum of their ages is 34 yr, what is Sania's age? Let the ages of Mira, Tina and Sania be 6 x,4 x and 7 x respectively. A basket contains three red and four green balls. If four balls are drawn at random from the basket, what is the probability that two are red and two are green? What is the product of X and Y? if the data in statement I alone is sufficient to answer the question, while the data in statement II alone is not sufficient to answer the question. if the data in statement II alone is sufficient to answer the question, while the data in statement I alone is not sufficient to answer the question. if the data in statement I alone or in statement II alone is sufficient to answer the question. if the data in both the statements I and II is not sufficient to answer the question. if the data in both the statements I and II together is necessary to answer the question. What is the rate of interest p.c.p.a.? I. An amount doubles itself in five years at simple interest. II. Simple interest of Rs. 1600 is obtained in two years on an amount of Rs. 4000. In how many hours can A alone complete the piece of work? I. B alone can complete the piece of work in 28 h.
II. A, B and C together can complete the piece of work in 18 h.
Both statements are not sufficient to get the answer. What will Anjali's age be 5 yr from now? I. Anjali"s present age is twice Tosha's present age. II. Tosha, who is half Anjali's present age, was 21 yr old 5 yr ago. What is the perimetre of the square? I. The measure of one of its sides is given. II. The measure of its diagonal is given. 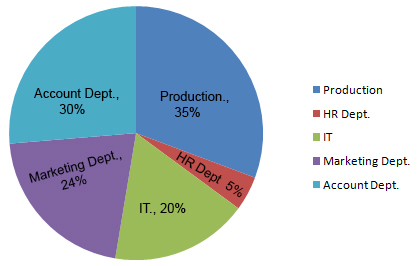 What is the respective ratio between the number of Females working in the HR department and the total number of employees in that department? The number of Males working in the Production department of the Organization forms what percent of the total number of employees working in that department? The number of Females working in the IT department forms what percent of the total number of employees in the Organization from all departments together? What is the respective ratio of the number of Males working in the Marketing department to the number of Females working in that department? What is the total number of units manufactured by Company C over all the years together? What is the approximate percent increase in the number of units sold-by Company E in the year 2007 from the previous Year? What is the respective ratio of total number of units manufactured by Company A and B together in the year 2009 to those sold by them in the same year? What is the average number of units sold by Company D over all the years together? 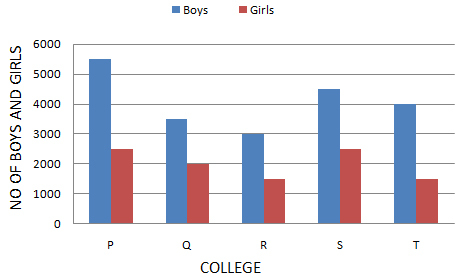 What is the respective ratio of girls to boys in College T? Number of boys in college S forms approximately what percent of number of boys in college Q? What is the average number of boys from all the colleges together? What is the respective ratio of total number of students from college S to the total number of students from college P ? NOTE : Figures in brackets indicate maximum marks in that subject. What are the total subjects together? What are the average marks obtained by all the students in Maths? What is Miloni's overall percentage in the exam? What is the respective ratio of marks obtained by Purab in Science and English together to the marks obtained by Rachana in the same subjects? How many students have scored more than 80 percent in more than one subject? Two students (Miloni, Purab) have scored more than 80 percent in more than one subject.